Hundred-and-Seventh Sidra՚ (continues into the next parasha), the Sons of Ḳahath continued. Hundred-and-Fourth Sidra՚ (Num. 1:1-54): The census, and the Levites. Sefer Bemidbar opens with a census of the Children of Israel, which takes place in the Wilderness of Sinai on the first day of the Second Month in the second year after the Exodus from Egypt. YHWH commands Moses to take a head count of the Community of the Children of Israel according to their Clans, Fathers' Houses, and names; every male from the age of twenty years and upward. Aaron and the Nasi [prince, chieftain] of each tribe assist Moses in the taking of the census. The Levites, however, are not to participate in the census of the tribes of the Children of Israel. Because the Levites are responsible for the Mishkan, its implements and vessels YHWH commands Moses to take a separate census of the Tribe of Levi. The Levites have several duties; they dismantle and erect the Mishkan, transport and serve in it, as well as guard it against any intruder. Anyone who is not a Levite that comes near to the Mishkan is to be put to death. If a regular Israelite does approach the Mishkan the wrath of YHWH will be against the Community of the Children of Israel. The camps of the Levites, which are the first layers of camps surrounding the Mishkan, act as a barrier preventing any possible encroachment onto the Mishkan. Hundred-and-Fifth Sidra՚ (Num. 2:1-34): The arrangement of the Camp. The camps of the Children of Israel surround those of the Levites. The tribes are divided into four encampments one for each side of the Mishkan camped according to their tribal standards. Each encampment consists of three tribes; one 'senior' tribe and two 'junior' tribes. When the tribes break camp they journey according to the order of their encampments with the Mishkan and Levites being placed between the second and third encampment of the Children of Israel. Hundred-and-Sixth Sidra՚ (Num. 3:1-4:16): The kohanim, the status of the Levites, census of the Levites, census of the firstborn, and the Sons of Ḳahath. A kohen is a descendant of Aaron the brother of Moses. Aaron had four sons: Nadav the firstborn, Avihu, Elՙazar and Ithamar. Nadav and Avihu were struck down by YHWH for bringing a strange fire-offering into His presence. Nadav and Avihu died without having sons. The Tribe of Levi is formally assigned to Aaron so as to assist in the service of the Mishkan. The Levites are a replacement for the firstborn of the Children of Israel, "For mine is every firstborn, on the day that I struck every firstborn in the land of Egypt, I made holy to Me every firstborn in Israel, from man unto beast; Mine they shall be I am YHWH" (Num. 3:13). A census is taken of the Children of Levi of every male from the age of a month and upward according to their Fathers' House and their Clans. 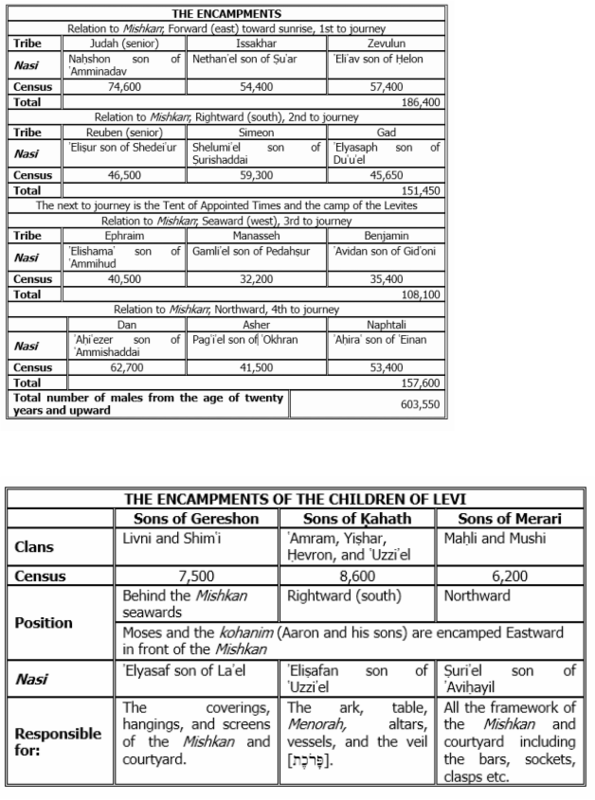 The Children of Levi have three clans; Gereshon, Ḳahath, and Merari. The coverings, hangings, and screens of the Mishkan and courtyard. The ark, table, Menorah, altars, vessels, and the veil [פָּרֹכֶת]. All the framework of the Mishkan and courtyard including the bars, sockets, clasps etc. According to the text the total for the census of the Children of Levi is 22,000, however, when the individual tallies are combined the number reached is 22,300. A possible explanation for this discrepancy is that a scribal error has occurred in verse 28, where the number of the Sons of Ḳahath is given as 8,600, and that the original reading may have been 8,300; thus the Hebrew שלש  being mistaken for שש . "And take the Levites for Me I am YHWH, instead of every firstborn among the Children of Israel" (Num. 3:41). Since the Levites are replacing the firstborn YHWH commands Moses to take a census of all the firstborn males of the Children of Israel from the age of a month and upward. The results of the census show that there are 22,273 firstborn males as compared to 22,000 Levites, which gives an excess of 273 firstborn males. This means that 273 firstborn males are without a Levite to substitute for them. The problem is solved by redeeming the excess of the firstborn at the redemption price of five Holy sheḳels per firstborn giving a total of 1,365 Holy sheḳels of silver, which is then given to Aaron and his sons. Cover the Ark/Chest of the Testimony first with the veil [פָּרֹכֶת], second a leather covering, and third a blue cloth. Spread a blue cloth over the table of the Bread of the Presence, followed by a scarlet cloth on top of which is placed a leather covering. Cover the Menorah with a blue cloth and then with a leather covering. Spread a blue cloth over the incense altar and then a leather covering. Put all the vessels and implements used in the service of the Mishkan into a blue cloth, which is then placed into a leather covering. Clean out the sacrificial altar and then spread over it a purple cloth over which is placed a leather covering. Once the holy vessels have been covered the Sons of Ḳahath may enter the Mishkan, in order to carry them out. If the Sons of Ḳahath touch the holy vessels they will die. Elՙazar the son of Aaron is made the Nasi of the Nesi՚im [pl. of Nasi] of the Children of Levi. He is responsible for the Mishkan as well as its contents, including the oil for lighting the Menorah, the incense for the incense altar, the perpetual gift-offering, and the anointing oil for anointing. Hundred-and-Seventh Sidra՚ (Num. 4:17-20 continues into the next parasha): The Sons of Ḳahath continued. "YHWH spoke, to Moses and to Aaron saying. Do not cut off, the tribe of the clans of Ḳahath; from the midst of the Levites. And this you shall do for them and they shall live and not die, when they draw near to the holy of holies; Aaron and his sons are to come in, and assign them each-man - each-man - to his service and to his burden. But they are not to come in and see even for an instant the Holy lest they die" (Num. 4:17-20). A group of people are sailing in a boat when one of them takes a drill and begins to drill beneath his seat. His companions say to him: "What are you doing?" The man responds, "Why does it concern you? I'm only drilling under my own seat!" To which the others reply, "But when the water comes in you'll flood the boat for us all!"